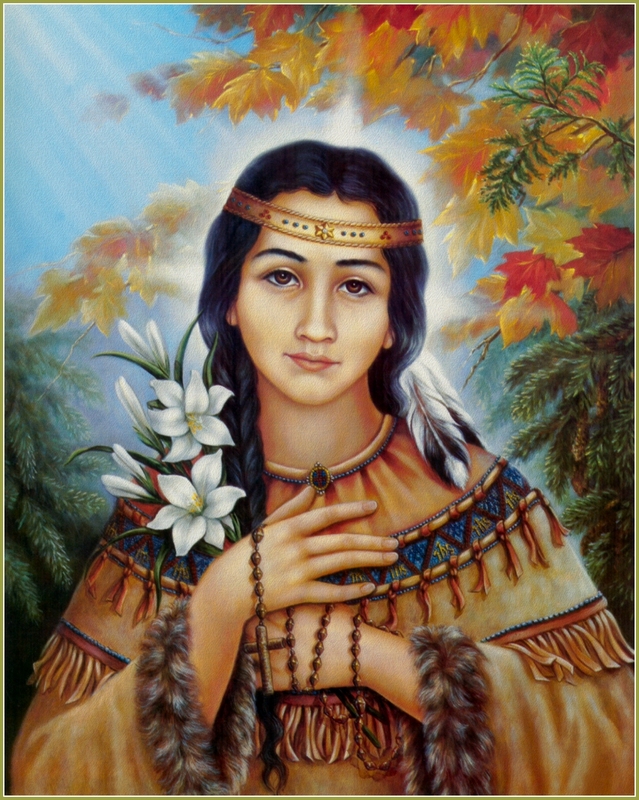 This Saturday, July 14, is the feast day of Blessed Kateri Tekakwitha. Known as the Lily of the Mohawks, she was the first native American to be beatified. This was done by Bl. John Paul II in 1980. On Oct. 21, she will be canonized by Pope Benedict. Kateri was born in 1655 in Auriesville, New York. Her mother was an Algonquin, and her father was a Mohawk chief. While smallpox claimed the lives of her parents and brother she survived this disease, but it left her with poor vision. She was given the name "Tekakwitha" which means "she who bumps into things." The Mohawks only tolerated the Catholics because of a peace treaty with the French. Having quietly received instructions in the faith from three Black Robes, she was baptized at the age of 18. Because of her conversion, she was continually ridiculed and threatened with death. She was treated as a slave and received no food every Sunday because she would not work on that day. At the urging of a priest concerned for her safety, she left her village in secret and went to a settlement of Catholic Indians near Montreal. She made a perpetual vow of virginity which was unprecedented for an Indian woman whose survival depended on being married. Kateri practiced rigorous penances and fasting, offering these up for the conversion her nation. She died from a serious illness in 1680. Blessed Kateri is truly an example for all of us. She knew that the faith is true, stood by it and lived it. There are some things that cannot be compromised. All the doctrinal and moral teachings of Christ stand true for all ages. Even the Pope cannot change them. He teaches them. Our government may not understand why the Church will not accept the HHS mandate for contraceptive services, but we have no choice but to hold fast to our faith. Blessed Kateri was misunderstood and perhaps feared by her own people, and she remained steady in all the teachings of the faith even to the point of keeping Sundays holy. May she intercede for us to be as upright and faithful as she was. I love this. I am choosing Kateri as my confirmation saint!